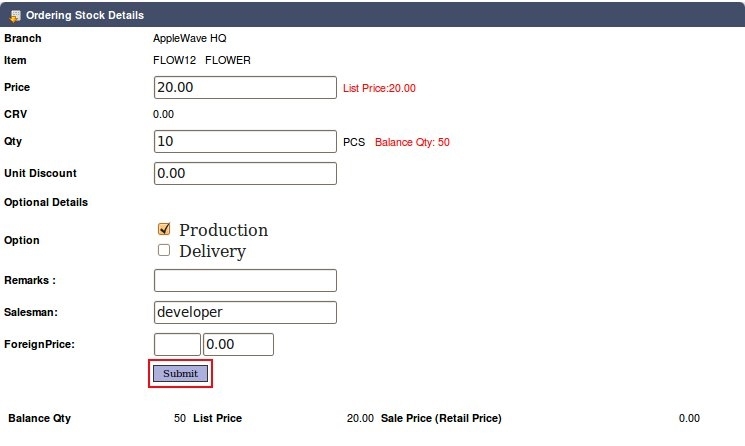 This function is used to create customers' sales order. Click on 'Select Customer' to choose a customer account. A new screen will appear. Enter a keyword and click on 'Search'. A list of customers that match the search will appear below. To add a new customer account, click on 'New Corp Acc' to create a new corporate account or click on 'New Personal Acc' to create a new personal account. Click here to learn how to create a customer account. 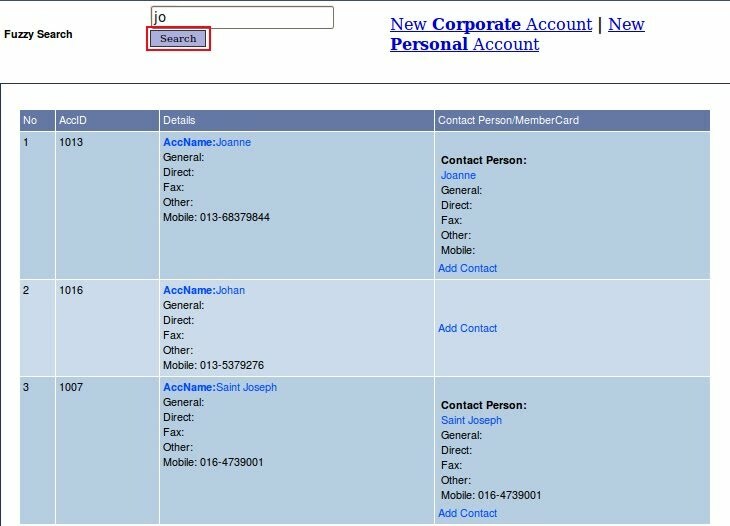 Click on 'Contact List' to select a contact. This is usually for account that has more than one contact person. Choose a contact person and click 'Select'. 'Edit Account' is used to change the customer's details. Click here to learn how to edit customer's account. Click 'Add Contact' to add a new contact person to the account. Fill in the details for the new contact and click 'Add'. Click on 'Reset To Cash' to reset the sales order to a cash sales. This is usually for customer that show up in the store and bought the ready make items, customer do not have an account and make payment in cash. Fill in the required details on the form. Enter the recipient details, delivery details and message details. Click on 'Standard Messages' to choose a message from the list. Standard Messages are messages that are frequently use by customer, user configures these messages into a list for selection to speed up the order creation time. Click here to learn how to configure the message. Click on the 'Acc Name' button under the message details, the Customer Account Name will be generated as the Sender Name on the message card, this saves the user time in creating an order. If the Sender Name is different from the Customer Account Name, then the user will have to type it in manually. Flerin - unit of currency that is used by Interflora. The conversion rate will be different from time to time. Idoflo Item Desc - item code and description for the item. This is needed for international orders where each item code and description are different for each country. User can select the recipient address from a list of configured delivery location. Click on the 'Select' button next to the Postcode field, a new screen will pop up. Select a State and enter the Keyword, click 'Search'. Select a location from the list, the recipient address will be filled up accordingly. If the user is not sure of the item code, user has to click on 'Package' or 'Search Item' to search for it. Look up on how to add item or add package. Enter a keyword and click 'Submit' to search for the item. The related item will be listed below. Select an item and click on it. A new screen will appear. Insert the quantity and unit discount of the item, then click 'Submit'. The item will be added to the order. If the user knows the exact item code, user can add item by just typing in the item code, quantity and discount, then click 'Quick Add'. The item will be added to the list. In the item list, there is a field for P(Wkshp)/DO. User can click on it to change the option: 'Y' for Yes, 'N' for No. P(Wkshp) - Production (Workshop), the items that need production will be sent to the Workshop for manufacturing, these items will appear in the Processing Listing. DO - Delivery Order, items that have a delivery order requires the user to deliver the items to the recipient. These items will appear in the Delivery Item Tracking. After everything has been done, click 'Save and Close' to create the order.